This is Part 2 of a blog I recently penned about a heartwarming and enlightening film that spotlights the Syrian refugee crisis and those who are attempting to bring humor and humanity to the refugee camps – The Language of Laughter. Read the prior blog here. Question from Louise Sattler:What educational lessons do you hope that people will learn from this film/mission? Answer from Reilly Dowd: Before I started this project, someone once told me, “In feature films, the director is God; in documentary films, God is the director”. I now know this to be completely true. When I first went to Jordan, I really didn’t know where the story would take me. It was by chance that we met Hanadi, a 26-year- old refugee mother of three living in the Zaatari camp. Unlike so many other young women I met, she was willing—and able—to share her story. The horrors she had faced in Syria—car bombings, a violent raid on her home, her husband abducted—were unimaginable to me. But in the two years that I have been documenting her life, things have only gotten worse. 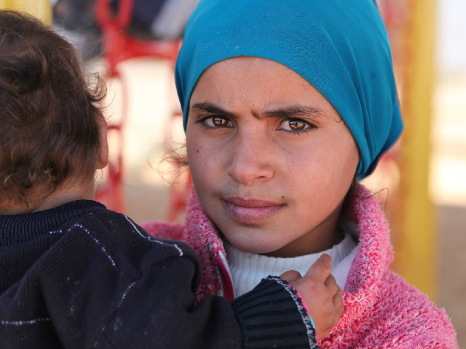 Hanadi is one of 12 million people who have been displaced by Syria’s bloody civil war. My hope is that this film will lead to more than just raising awareness about the refugee crisis. Our access into the life of a young refugee mother today presents a side of the crisis that is so rarely seen or understood. By watching the film, I hope viewers will be inspired to act and to think twice as a global debate about refugees rages on. The film is first and foremost a human story. But given the scale of the crisis, it’s inevitable that politics play a role. We now look back on Rwanda, which was only a little over 20 years ago, and think, how could we have let this happen? All Americans have the ability to get information on what’s happening in Syria—they also have the right to put pressure on their representatives in Washington. This is a humanitarian crisis—one that is now on a global scale. I think much of the world is looking to the U.S. for leadership on the crisis. There is a lot of legitimate fear out there about terrorism, especially here at home inAmerica. But many are quick to associate refugees with terrorism. Something I think many people really don’t understand is that if somebody truly wanted to carry out an attack in the United States, the chances of them coming in as a refugee are so small. Reilly continued to explain the refugee registration process for immigration to the United States from Syria. Firstly, they would have to be a registered refugee in a UNHCR camp outside of Syria. At a minimum, the process takes two years– and the refugees who make it to the final round or more vetted than almost anyone else. I think our country needs to take a harder look at those who we are denying entry to. The vast majority of them are running from the very thing that we fear. I know it’s often hard for many people to grasp what is happening, especially when you hear numbers like 5 million Syrian refugees. We can help refugees by humanizing them. I hope this film will do just that. Question from Louise: Your greatest challenge- other than money- with this project? Answer from Reilly: Without giving our story away, I can tell you that out of pure desperation, Hanadi makes a dangerous decision—one that puts her and her three young daughters in grave danger. It’s hard to follow someone’s life for nearly two years and not become emotionally involved. Walking the line between being an objective journalist or true documentary filmmaker and someone with a heart is definitely a challenge. I set out to document Hanadi’s life as if I was never there. But I’ve had countless debates with myself over whether I should just stop the film and help Hanadi myself. She’s become someone I very much respect, admire and care about—so documenting her life at arm’s length, especially as her situation became increasingly dire, has been a significant personal struggle. Question from Louise: Red noses! Love it – but ever think of pink, green or another color? Answer from Reilly: Funny question, but not my job! Red Noses clowndoctors International has been around for two decades, operating out of Vienna, Austria. That’s their thing! The Language of Laughter continues their crowdfunding campaign. * Please click here to support this film.